Tradewell Ferromet Pvt Ltd can provide Cold Forged & Hot Forged Rail Screws / Special Alloy Rail Screws with complete material compliance. Banking on the skills of our qualified team of professionals, we are instrumental in offering supreme quality range of Rail Screw. Size: As Per Drawing No. T- 3911, 3912, 3913 Etc. In order to meet the various requirements of the customers, we are engaged in offering a wide assortment of Rail Screw Spike. We also manufacture rail screw-plate screws. A rail screw is of 6" length, used to fix a plate or fasten the rail. 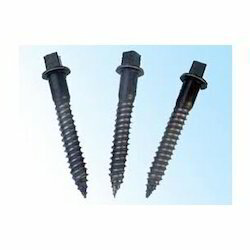 Screw Spikes are used for fixing of tie plates on to the wooden ties in pre-bored holes and with plastic inserts pre-cast in concrete sleepers. Our manufacturing range of various types of rail spikes namely track spike (Dog Spike), Lock spike, screw spike, boat spike, single shank spike and double shank spike. We are among the largest manufacturers of track, Lock, screw, and single shank spikes in the country. Every spike is manufactured, inspected, minutely scrutinized and packed under close supervision. We are offering an alluring range of supreme quality Railway Screws to our clients. Varieties of sizes are available with us, and this Railway Screw is offered at very nominal prices. 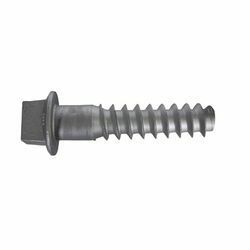 These Railway Screws are flexible, durable and corrosion resistant. Our manufacturing range of various types of rail spikes namely track spike (Dog Spike), Lock spike, screw spike, boat spike, single shank spike and double shank spike. High quality Railway Screw is manufactured using superior quality raw material. The offered product is precision engineered as per international industry standards and norms. Varieties of sizes are available with us, and this product is offered at very nominal prices. These products are flexible, durable and corrosion resistant. Most popular Rail fixing component. Used in Wooden and Concrete sleepers to tighten Rail to sleepers.